With nothing but ocean below, and nothing but sunlight holding it aloft, the Solar Impulse 2 (Si2) has resumed its epic journey, departing Nanjing, China on 30 May at 18:30 UTC. Having waited since April 21 for the right conditions for departure, the flight is no less harrowing now that it is underway. Although the aircraft is wider than a Boeing 747, it is lighter than a pickup truck, and only slightly faster than your grandmother’s Oldsmobile. Flying non-stop for five days and nights, Andre Borschberg will pilot the solar airplane at altitudes of up to 30,000 feet, at a speed of no more than 140 kilometers per hour (86.991 miles per hour). The 5,000 miles from China to Hawaii will probably feel a lot like a 5-day cross-country trip on a Greyhound Bus. Borschberg will be squeezed for days and nights on end with only 20 minutes of sleep every five hours in an unpressurized, unheated cockpit not much bigger than his seat, which also conveniently doubles as a toilet (I’m not sure that would be considered convenient in a Greyhound bus). Taking turns sharing the excitement, Andre Borschberg’s partner, Bertrand Piccard, will fly the second half of the TransPacific trip from Hawaii to Phoenix, Arizona. Only 77 years ago, Aviator Amelia Earhart disappeared on a famous journey over the Pacific Ocean. The similarities are not lost on the Solar Impulse team. Depending on crosswinds, the flight from China to Hawaii could take as long as seven days. The team’s first encounter with the perilous reality of killer crosswinds occurred on the solar airplane’s flight departing Mandalay, Myanmar (Video below). While crossing to Chongqing, China, the lightweight solar airplane faced an amazing challenge presented by the forceful winds. Piccard, who piloted that leg of the journey said, “I almost disappeared from the air traffic controller’s radar because I was flying backward.” The heavy winds are responsible for the long delay of this current flight. Having trained for possible emergencies, the solar airplane could be abandoned by its pilot. According to Nat Geo, the two intrepid solar pilots trained with the German Navy, parachuting into the frigid North Sea. Once in the water, they practiced untangling themselves and inflating the life raft into which they learned how to haul themselves. It doesn’t sound comforting, but in a solar airplane hanging between life and death over the Pacific Ocean… well, God willing they won’t have to use it. Former Swiss fighter pilot and entrepreneur extraordinaire, Andre Borschberg founded the Solar Impulse project with Bertrand Piccard in 2004. Some of Borschberg’s old military aviator buddies are reportedly holed up with the mission control team based in Monaco. 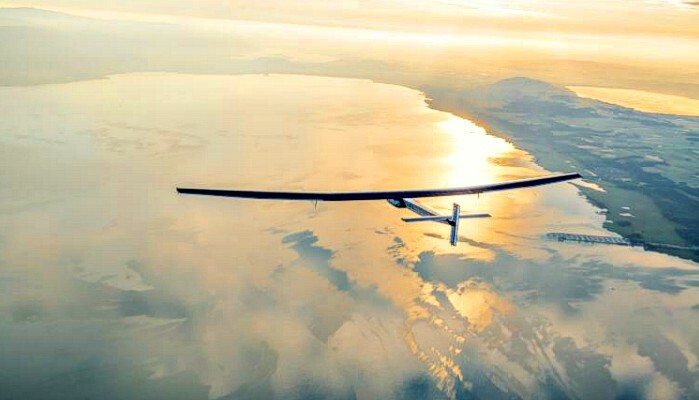 The solar airplane’s progress has been monitored 24/7 since it first took off from Abu Dhabi, UAE, on March 9, 2015, and the 12-leg historic flight around the world is generating huge international excitement. Taking turns piloting from UAE to Oman, then India, Myanmar, and China, the Solar Impulse team has spectacularly enlivened a #FutureIsClean mission promoting clean, renewable energy and technologies. A colossal marvel of clean, renewable energy technology, their solar airplane is the epitome of cleantech in action. With a wingspan stretching 236 feet, every sun-kissed inch is covered with sun-loving cells. Over 17,000 photovoltaic solar cells are spread over the wings and down the spine. With nothing other than sunlight powering every single system of the solar airplane throughout the days, the solar cells are also producing enough stored energy in four batteries to power the Solar Impulse 2 throughout the nights. Soaring bravely into the unknown future of the solar energy era, Borschberg and Piccard are testaments to ingenuity, innovation, bravery, and skill. Carrying their brilliant sunlight into the dark nights ahead, they are proving that even challenges as wide and deep as oceans are just distances waiting to be crossed. Lighting the way for all of us, they are like bright rays of sun charging our batteries for a fossil-free and clean energy future. May God grant them fair winds, good luck, and God’s Speed. UPDATE – LANDING IN NAGOYA (JAPAN). Unfortunately the current weather window to reach Hawaii has closed. The cold front is too dangerous to cross, so we have decided to land in Nagoya Airfield, [at 14:30 UTC June 01] also known as Komaki Airport, and wait for better weather conditions in order to continue. We would like to thank CAB, MILIT, MOFA, Japanese Customs and Immigration JSDF, Nakanihon Air Service, Centrair, Kuehne-Nagel​, for their incredible help to our team in Nagoya.